Ask most chess players what would help them calculate better and they’ll answer “to be able to visualize more moves ahead”. But great calculation isn’t always about seeing many moves ahead… but seeing the correct one! Once, an old master was asked how far he saw ahead. This apparently apocryphal story hides a great truth: if you find the best move, you don’t need to calculate long 10 moves variations to justify it. You just need to play it! Of course, this is easier said than done. After all, how do you find the best move? 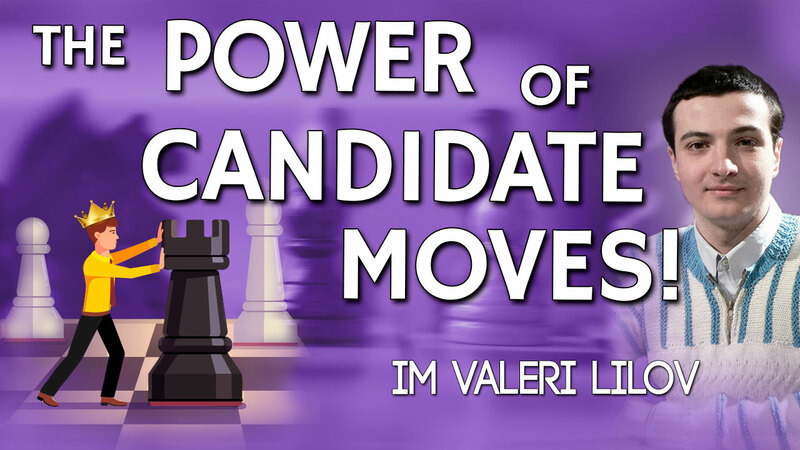 This Saturday, I am going to help with this core problem of playing chess by revealing the great power of candidate moves! Many decades have passed since GM Kotov wrote about Candidate Moves in his “Think like a Grandmaster” book. Now IM Lilov is going to share the modern interpretation of the concept plus present a few tips on how to find them during a game. > How to choose and study your openings, making it easy to find the best moves in the early part of the game. Plus learn one of Valeri’s favorite openings, with easy-to-learn but powerful ideas and plans! > The power of Candidate Moves in forcing positions. How to find the winning moves in critical positions. Start finishing off your opponents without mercy! > How to quickly evaluate your position and decide where you should focus your attention. Limiting yourself to only one part of the chessboard will definitely shorten your Candidate Moves list, making calculation easier!